Yeh Rishta Kya Kehlata Hai 24th October 2016: Naira went to Kartik and asked him to come in his dad’s cabin. He said that he needs to talk about something important with his dad. Naira said to Naitik that Kartik should work with Gayu as she could hire a consultant for her work. Naitik met Kartik and asked him to share anything he wanted. Kartik could not give his resignation. Kartik came and asked Naira as what she was doing there. She asked him for the file. He looked for the file. A box fell in which she saw her pictures. He put the things back and gave that box to Naira as he had no right to keep the memory. Akshara talked to naksh and asked him not to worry about home and everything and come soon after completing his work. Kartik said to Rajshri that he had vacated the room. Kartik said that he had a lot of work to do and left from there. Nunnu asked him not to leave. Kartik stated that it was tough for him to leave from there but he had to do that. Kartik thought to give the resignation letter the day after. 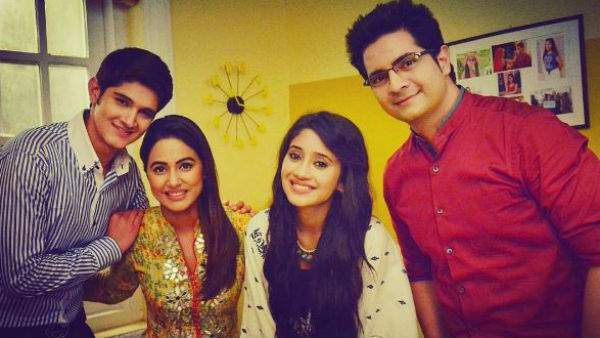 Check: Yeh Rishta Kya Kahlata Hai 22nd October 2016. Everyone saw Naira sad and asked her what happened. She saw a paper frog and got sad. Kuhu asked Varsha as why she changed the wifi password. Varsha asked her to find study material in library. She asked her to work hard. Nunnu said that he would get her to library. Varsha said that she would go with her. Nunnu said that he would go and they would have fun. Varsha was worried for Kuhu. Naitik asked about Naman and whether he should receive the harsh punishment or not. Mishti came there and said that his father loved her a lot. She went from there. Everyone got sad. Karishma cried and went from there. Akshara said to Naitik that they had enough time and they could decide. Naira and Gayu went to karishma. She said that she could not face the love test. Akshara came there and asked her to keep fast for Naman and hugged her. She said that they did not hate Naman as he was their own and they would do anything for Naman. Karishma then hugged Mishti. Varsha was worried as Kuhu did not come yet. Akshara asked Naitik to work from home only. He said that it was a lot and he need to go to office. She got angry. He asked her to have water. Gayu saw them and said that her love story should be like theirs. Naira recalled Kartik. Gayu asked Varsha about her love marriage and asked as who proposed first. Varsha told her about their love story. Naira thought of Kartik. Stay tuned for latest Yeh Rista Kya Kehlata Hai news and updates.